WORDLESS MAGIC – It is a rare concert that evokes many disparate memories with equal intensity, so that listeners can recover lost threads and spin skeins of time and place, reeling them in to reconstruct the fragments of their lives. The Grand Finale concert of the Calcutta School of Music’s centennial celebrations was one such: the rich, resonant sounds of the Bohuslav Martinu Orchestra conducted masterfully by Debashish Chaudhuri, along with Jana Chaudhuri’s powerful pianism, made this concert a first for this city in many decades. CZECH PHILHARMONICS LEFT INDIA SPELLBOUND – In the course of the concert tour, realized between January 10 and January 21, 2018, the philharmonic orchestra gratified the Indian classical music enthusiasts in four Indian cities, in Delhi, Mumbai, Panjim (Goa), and Kolkata….The commitment and brilliant performances put by the conductor and all the musicians did not go unheeded. The audience expressed their unrelenting gratitude with long-lasting applauses and demands for encores. EBULLIENT! – Brought to India to celebrate 70 years of Indo-Czech diplomatic relations, the evening had some obvious, and some not-so-obvious Indo-Czech connections. The most obvious was the ebullient Maestro Debashish Chaudhuri, once of Kolkata, now of the Czech Republic, who conducted rousing versions of Dvorák’s Eighth Symphony and Rachmaninoff’s Piano Concerto No 2. THE GRANDIOSE FINALE OF THE 50TH DVORAK MUSIC FESTIVAL – The breathtaking event for the classical music lovers celebrated 50 years of existence. This year was finalized by a grandiose open air concert. At the St. Mountain by Pribram Dvorak Requiem was played by PKF – Prague Philharmonia led by conductor Debashish Chaudhuri, with soloists Jana Srejma Kacirkova, Ester Pavlu, Josef Moravec and Martin Gurbal. Three choirs took the uneasy task for the choir parts: Prague chamber choir, Veprek mixed choir and Ladies chamber choir Krasky. ENTHUSIASM FOR DETAILS AND FULLNESS OF SOUND – Beethoven´s Symphony no. 1 finalized the concert in the brilliant performance of the Pardubice Chamber Philharmonic. Energetic conductor of Indian origin Debashish Chaudhuri provided unusual energy to the whole rendering full of enthusiasm for details and the fullness of sound of the whole orchestra. The final massive applause of the audience showed a great appreciation for the quality of interpretation for the well prepared orchestra, as well as tribute to the author himself. 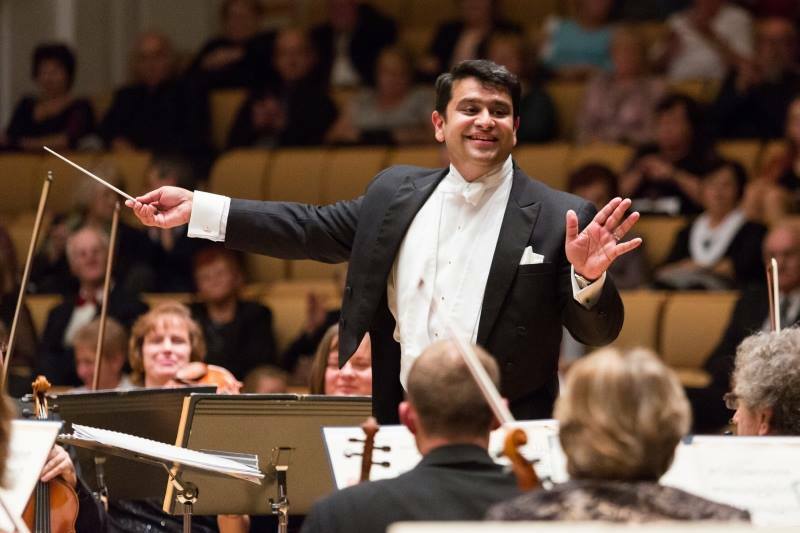 TALENT AND EXPERIENCE – It was not the first time for the likeable Indian Debashish Chaudhuri to conduct the Pardubice Chamber Philharmonic. Last year he brilliantly managed a unique concert organized by the Indian embassy at the Prague Bethlehem Chapel. Through his kind and natural approach he won the respect of the audience in Suk hall in the House of Music from the first moment and didnt even wink his eye during the audience´s mistaken clapping in the middle of Elgar´s piece. Chaudhuri is graced by talent and experience from the world stages, his exotic origin is perceived as a bonus by many. He had a great understanding with our Pardubice musicians.